It’s hard to believe that problems in your mouth can affect your growing baby, but research has confirmed a link between gum disease in mom and premature or low weight birth in the new baby. Regular teeth cleanings as well as proper oral hygiene might be just as important as ultrasounds and OB/GYN visits. 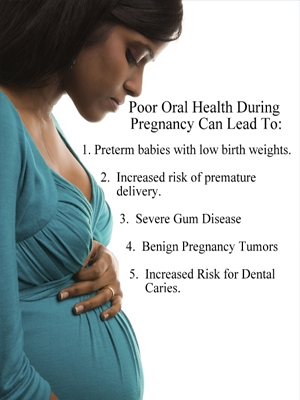 Pregnancy hormones put you at greater risk of gum disease. Luckily, this is all preventable if you know what to look out for. Certain hormones — namely progesterone and estrogen — are elevated in a woman’s body during pregnancy. These hormones make the gums more likely to overreact to the presence of even small amounts of plaque. This reaction usually shows up between months two and eight of pregnancy. Women usually notice their gums getting redder and puffier, and their gums are tender to the touch and more likely to bleed from flossing or brushing. In extreme circumstances, in the third trimester, we have seen patients with an excruciating, burning sensation in their gums and, because of their pregnancy, we are unable to medicate or give them relief. This is another reason it’s critical to make sure you don’t have gum disease before you conceive. In addition to the fears of low birth weights or preterm births, expecting mothers should also be aware of other diseases their babies can contract due to complications from oral diseases. 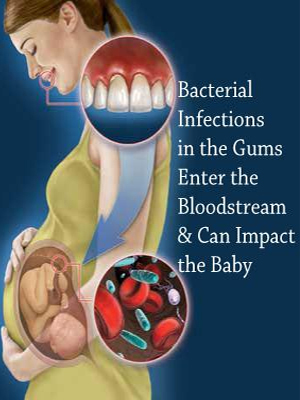 Gum disease itself can lead to heart problems and blood infections, all of which could potentially be passed on to the baby. So what’s an expecting mother to do? Get a clean bill of health from the dentist before you conceive. It’s best to start take care of your oral health before you actually conceive. See the dentist, get a professional cleaning, and take care of any oral health problems. Also Remember, your child should see a dentist by the time the first tooth comes in. Switch to a bland flavored toothpaste. Sometimes morning sickness makes it really tough for soon-to-be moms to brush. Go with an all-natural toothpaste that doesn’t contain harmful chemicals. *Brush, floss, rinse, repeat. Keeping up with your oral hygiene is the easiest way to set yourself up for a successful pregnancy. If you can’t stand flossing, try a flossing stick, which gets the job done in under a minute. Don’t skip dental visits. Dental cleanings and check-ups are especially critical during pregnancy due to the hormonal changes that put your baby at risk by making you more likely to get periodontal disease. Watch for bleeding gums. If you notice any changes in your gums, alert your dentist right away, as this could be a sign of gingivitis, which could impact your pregnancy and your baby. Avoid x-rays during pregnancy. If x-rays are essential (such as in a dental emergency), we will use extreme caution to safeguard you and your baby. Advances in technology have made x-rays much safer today than in past decades.